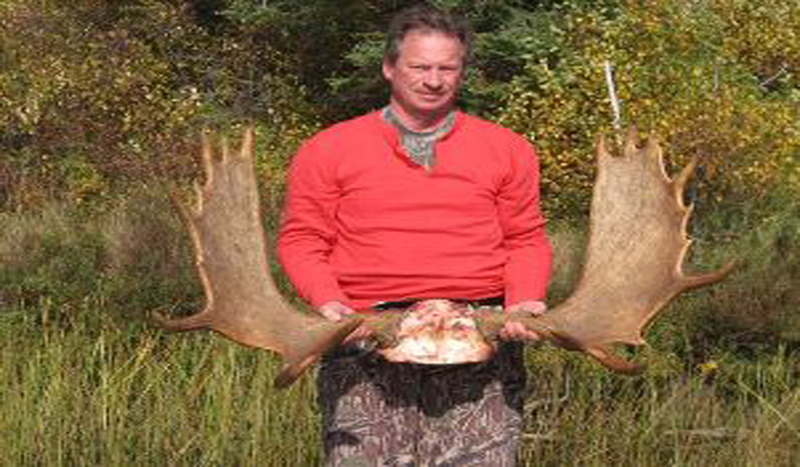 The Canada bear and moose hunting trips start in the Fall. 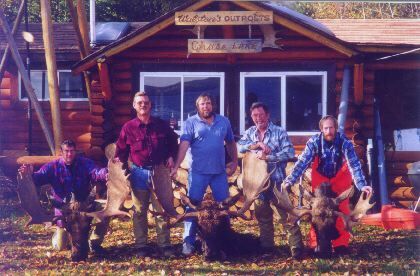 You receive air transportation (leaving from Kenora, Ontario), all camp facilities, boats, motors, gas, canoes, experienced guides, home cooked meals and, of course, world class hunting. 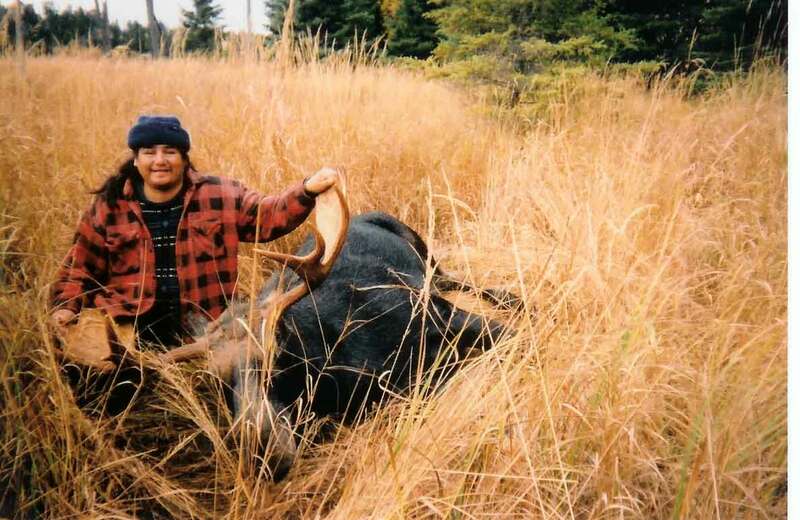 We have had 75% or better moose hunt success rate since we started in 1960. 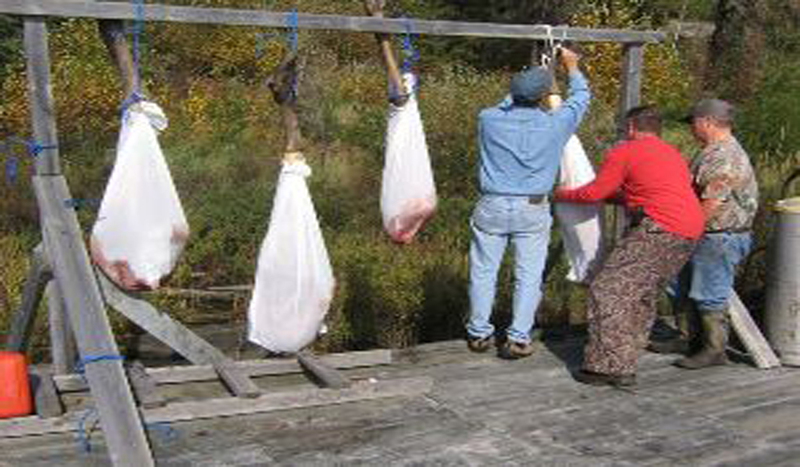 Also, a flight will arrive every second day to haul your game back to our docks in Kenora. We also have trophy white tail deer hunts. Our remote, rugged hunting zone for white tail deer is only one hour's drive north of Kenora. It has minimal hunting pressure and rugged terrain. Because only the strong survive, trophy bucks with 185 to 220 point rack scores and 250 lb plus, big-bodied bucks are very common and easily hunted. This hunt is semi-guided and has drive-in access to Separation Rapids Outpost, only. Inquire for availabilities and rates. This is a very popular hunt and openings are limited. The photos below show the quality of big deer in our area. The further north you go with no hunting pressure, the bigger and better they are. Bring warm clothing, rain gear, sleeping bag, rifle, shotgun, ammunition, fishing tackle, camera, medications, personal gear, refreshments, and don't forget to purchase your fishing and/or hunting licence in Kenora before your flight to the outpost. These hunts are all bull tags only. Inquire for rates and availabilities for calf tag / bull tag mix. License, food taxes and export permit(s) are extra. 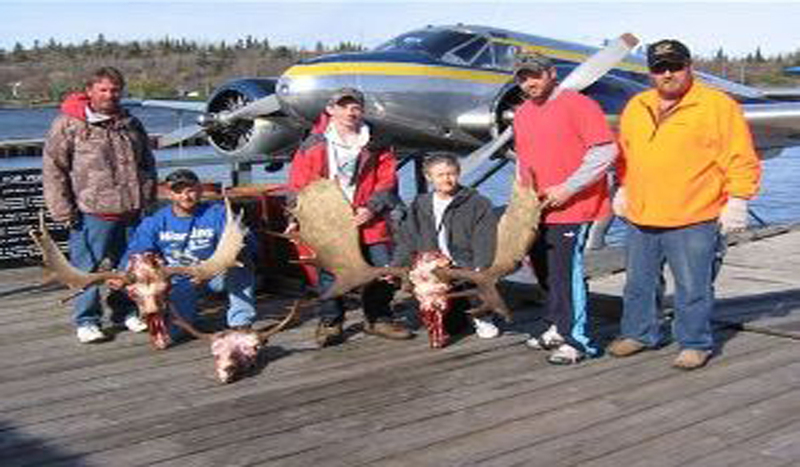 Includes, boat, motor, gas, local air transport, check flights, moose out, and game care. Inquire for rates and openings for parties of more than 2 archery hunters. These hunts are all bull tags only. Inquire for rates for bull tag / calf tag mix or any other special circumstances. Includes food & hunting license(s); taxes and export permit(s) are extra. We can customize the hunt and tailor it to your requirements. Please call or email. Includes local air transport, check flights, bear out, and game care. These hunts are semi-guided and include all pre-baiting; guaranteed active bait sites. We hunt as far west in Ontario as possible - right along the Manitoba border. This area produces many bigger bears - 625 lbs the largest taken in 1998. The healthy forage base and habitat in the west seems to produce bigger animals than regions to the east. References available on request. Please call or email us for more information. The wildlife is still very abundant in winter and you will see moose, wolves, rabbits, plus many other animals that are elusive and difficult to see in the summer. In fact, there are wolf tracks in the background of the photo above right (click on it to see a larger image). Winter wolf hunts are also available. For more details on any of these opportunities, please contact us. Please Note: In order to ensure we do not exceed our maximum number of guests at one time, it is important that each group arrives with only the number of people the reservation was originally made for. In order to hold a reservation, a deposit of $1000 U.S. per person is required within 10 days of making your reservation. Your deposit is non-refundable but it may be transferred to a later trip. Personal cheques are accepted for deposits only. The balance of your trip must be paid for in cash or travellers cheques.